Hang Son Doong, also known as the Mountain River Cave, is the largest in the world. Believed to be between two and five million years old, the cave is located near the Laos-Vietnam border. A large, fast-moving subterranean river sits inside, carving the limestone into smooth, unique shapes. At more than three miles, 660 feet high, and 490 feet wide, it is believed to be the world’s largest cave by volume; one half-mile block of 40-story buildings can fit inside. 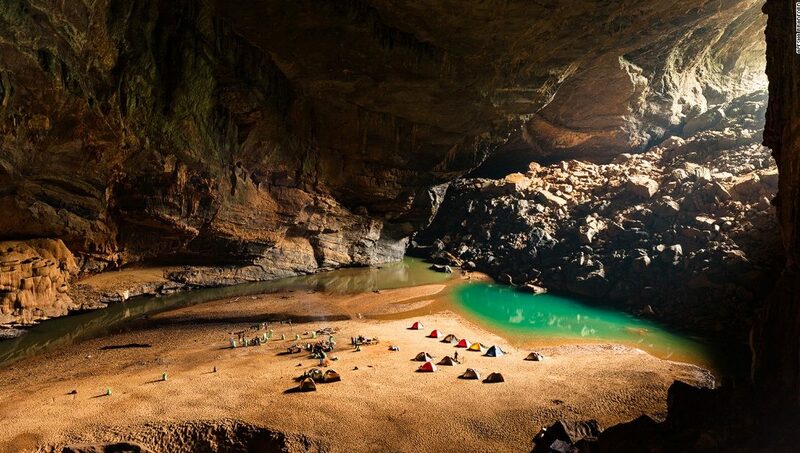 Hang Son Doong Cave was discovered in 1991 by Ho Khanh. Prior to its discovery, the whistling wind and roaring water, in addition to the entrance’s steep descent, prevented locals from entering the cave. The cave was designated a UNESCO World Heritage Site in 2003. In 2009, a group of cavers from the British Cave Research Association made the area internationally known; the expedition, led by Howard Limbert, conducted a survey. Their progress was hindered by a 200-foot-tall calcite wall, which was later named the Great Wall of Vietnam. In 2010, the group reached the end of the cave passage. Tourism in the Mountain River Cave began in 2013 with the first tourist group exploring via a guided tour. Visitors must acquire permits to access the cave, though they are made available on an extremely limited basis; only 800 permits were made available for the 2017 season, and they sold out in less than one day. Due to safety and conservation concerns, only one tour company is allowed access to permits: Oxalis Adventure Tours. Tickets are sold to the first applicants who meet all of the health requirements; the six-day trip requires visitors to trek around 31 miles. Additionally, this unique and rare experience is relatively expensive—the tours cost around $3,000USD per person. However, if you are lucky enough to snag a ticket, you will be one of only a few thousand to witness the inside of the cave. Fewer people have visited Hang Son Doong Cave than have summited Mount Everest.